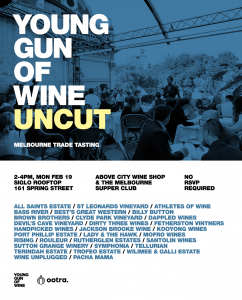 Young Gun of Wine is hosting a trade-only preview of Victorian winemakers entered in the 2018 Young Gun of Wine on the Siglo rooftop (above City Wine Shop). Winemakers will be pouring around 60 wines from Victoria. This is your chance to discover emerging wines and winemakers before anyone else. You will also get a snapshot of the new ootra app, which will be launched in the coming months. ootra is a radical new home to a community of independent winemakers and passionate hospitality professionals, connecting and trading in real time.